Fremont, CA – May 20, 2015…Coming off a strong weekend that saw a pair of 2nd place finishes Fremont, California’s Shane Golobic will look to continue his ultra consistent start to the campaign this Saturday & Sunday in Marysville & Chico. So far in this early season out west few have tallied better results than the 23-year-old San Jose State graduate, who has competed in a number of races across multiple different series throughout California. Golobic’s major focus in Northern California has been events with the King of the West 410 Sprint Car Series, the Ocean Sprints presented by Taco Bravo & the Civil War Series. Six of his starts earlier this year also came with the World of Outlaws, highlighted by runs from 18thto 8th in Placerville & 17th to 9th at the Mini Gold Cup in Chico. Golobic is also the only driver to have finished among the top-five in all four of the full-point events with the KWS 410’s so far this season. The attention for Golobic & the Keith Day Racing team this weekend shifts back to the Civil War 360 Sprint Car Series presented by Flowmaster, a title he captured last year with unmatched consistency. So far this season he’s made two starts in the three races, earning a victory on opening night in Marysville, the site of this Saturday’s event. He also led a number of laps in Calistoga on April 11, before finishing 2nd to multiple-time series titlist Sean Becker. With the new one-race throwaway factored in, Golobic’s two starts have accumulated the most points with the series. Sunday’s Civil War event at the Silver Dollar Speedway is the annual Fair Race, which Golobic captured last season after a spirited duel with Jonathan Allard. If you are interested in becoming a potential partner with the team please contact Shane at shanegolobic@yahoo.com or 510-364-3656. Tulare, CA – April 15, 2015…After opening the season with a World of Outlaws two-step the Merle Stone Chevrolet Thunderbowl Raceway kicks back into action on Saturday April 25, with the Civil War 360 Sprint Car Series presented by Flowmaster invading the Tulare, CA based one-third mile clay oval. It will be the lone Winged 360 Sprint Car event held at the Thunderbowl prior to the three-night Trophy Cup in October and marks round four in the battle for the Civil War Series title. It will also be the very first appearance at the track for the series, which started back in 1991 as the North/South Series. It then morphed into the present Civil War tour in 1993 and has been the premier series for Winged 360 Sprint Cars in California ever since. The night of racing will also be part of the first Prentice Motorsports Group “Double Down Bonus” weekend. If a driver can win the Friday April 24 event at Ocean Speedway with the Ocean Sprints presented by Taco Bravo, and then win at Thunderbowl Raceway on Saturday with Civil War, they’ll go home with a $3000 bonus. If they do so, they’ll walk away with $6500 total for the weekend. This is the first of nine Double Down Bonus weekends in 2015. After winning the World of Outlaws finale in March for the second year in a row Rutherford, CA’s Rico Abreu is set to be on hand next week. The 23-year-old last season was the lone driver to earn multiple victories with the Civil War Series and will be considered the one to beat next week. The win earlier this year was Abreu’s fifth career Thunderbowl Raceway triumph aboard his familiar Abreu Vineyards No. 24 mount. His two Civil War wins last year came at the Johnny Key Classic in Watsonville and the Tribute to Gary Patterson in Stockton. So far this season there has been three winners in the three Civil War 360 Sprint Car Series presented by Flowmaster events held thus far. Those drivers have included reigning series champion Shane Golobic of Fremont, current point leader Bradley Terrell of Sebastopol and most recently former series titlist Sean Becker from Roseville. More drivers looking to take on the Thunderbowl April 25 will include Watsonville’s Justin Sanders, Chico’s Jonathan Allard, Campbell’s Bud Kaeding, Auburn’s Andy Forsberg, Fresno’s Dominic Scelzi, Lemoore’s Carson Macedo, Sacramento’s Willie Croft, Easton’s Tommy Tarlton, Fresno’s Cory Eliason, Hanford’s DJ Netto, Fresno’s Craig Stidham, Wilton’s Matt Peterson, Clarksburg’s Justyn Cox, Hanford’s Mitchell Faccinto, Hollister’s Ryan Bernal, British Columbia’s Robbie Price, Fresno brothers' Koen & Kyler Shaw, Visalia’s Steven Tiner and many more. Also on hand during the night will be the Western RaceSaver Sprints & Vintage Cars. Following the Civil War Series event on April 25, Thunderbowl Raceway will then return to action on Saturday May 2 for J.D. Heiskell & Co. Race Night, featuring the USAC Western Midgets, Western RaceSaver Sprints & Vintage Cars. OnSaturday May 16 the annual Chris & Brian Faria Memorial will be presented at the one-third mile clay oval, which showcases the King of the West 410 Sprint Car Series, USAC West Coast Wingless 360 Sprint Car Series & Western RaceSaver Sprints. Marysville, CA (March 10, 2019) – Auburn’s Andy Forsberg bested a light field of Civil War Sprint Cars to win his 33rd career Civil War main event. Threatening skies and cold temperature damped the car count and fan turn-out but give promoter Dennis Gage credit for pushing the envelope and getting the first race of 2019 in at Marysville. The 10-time champion of the series clean swept the night by winning both heat races, the dash and the 20-lap main event. With the light car count, officials scratched qualifying and went to a two-heat race format. Forsberg won the dash and picked up an extra $100 from the Hall family. He also grabbed another $100 from the Hall family by winning the main event. Forsberg left Marysville $2700 richer for his efforts. Troy White, racing photographer and all-around great guy, added an extra $100 split between the two last place finishers in the main event. The race was also in tribute to the Sherm and Loree Toller. It was great to see the Toller family in attendance. Koen Shaw made the long tow from Fresno to compete at the Civil War opener. Shaw was able to finish in the second spot. Fifteen-year-old standout Blake Carrick raced hard all night. He finished second in both heat races, after leading a majority of both, and went on to finish third in the main event. Justin Henry and Pat Harvey finished fourth and fifth. Photo - Who is ready for some racing??? Who is ready for some racing??? California Civil War will kick off its 2019 season this Saturday at Marysville Raceway Park for the Toller Memorial Race. Look forward to seeing every one there. Just a friendly reminder get your tickets for the Championship Banquet before the price goes up. SAVE THE DATE- the 2018 Night of Champions Banquet for us and the Ocean Sprints will take place on 12/15 at Seascape Golf Course. Please save the date. More details to follow. 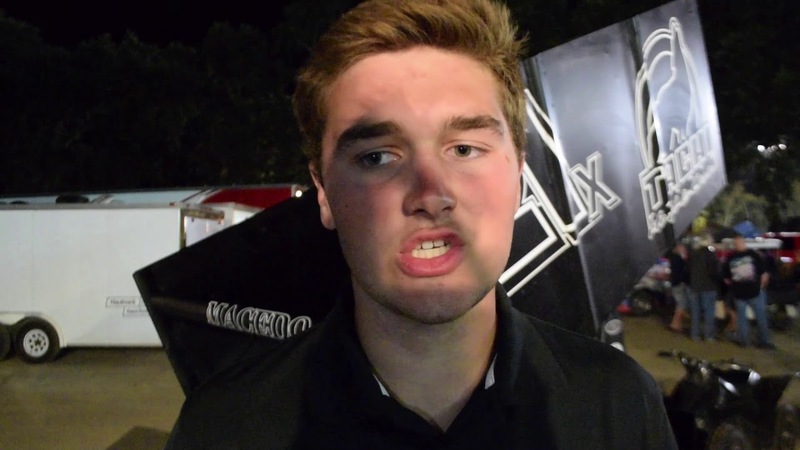 Video - Catching Up with the Champ- Cole Macedo! Catching Up with the Champ- Cole Macedo! --> Croft Claims Calistoga Lore while Macedo Wins Title! Some photos from the HK Classic! --> PHOTO BLAST! We had our camera out at the 2018 Howard Kaeding Classic and put together this little album! We hope you share away and enjoy! Fun fact, with his win on Friday night @tanner_thorson became the 91st different driver to win in series history! Photo - Last night’s trophy that Tanner Thorson will take home! Last night’s trophy that Tanner Thorson will take home! We want to send a BIG than you to all the teams and fans who made it out last night! It was a great show and we are looking forward to tonight’s @narc410 event! We want to send a BIG thank you to all the teams and fans who made it out last night! It was a great show and we are looking forward to tonight’s @narc410 event! Photo - Congratulations again Tanner Thorson and the 3-C team! Congratulations again Tanner Thorson and the 3-C team! Also worth a note- tonight was @tanner_thorson’s first career @civilwarsprints feature event win! RO- Hirst Thorson Netto Sanders Furr Golobic Bid Kofoid Carrick Shaw Offill BK Soares Nelson..